A Lens On History: Advances in DNA technology have given scientists a new tool with which to study ancient human origins. "I think ancient DNA becomes very powerful" now, says one researcher, "because it gives you a direct look into the past." 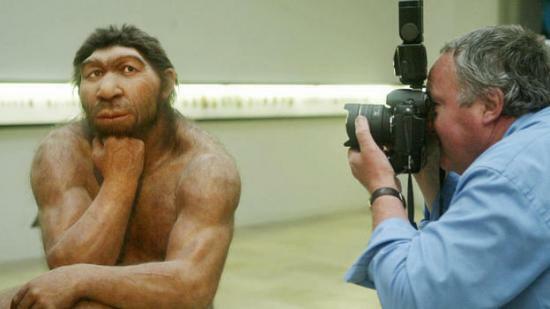 Here, a photographer shoots a reconstruction of a Neanderthal man at a museum in Germany. This year was a good year for Neanderthals. Yes, they did go extinct about 30,000 years ago, but scientists now say their genes live on — in us. Scientists also found a 40,000-year-old finger in a Siberian cave that apparently belonged to an unknown human-like creature. And hair from the corpse of a 4,000-year-old hunter revealed his blood type and a predisposition for baldness. What made these discoveries possible was DNA, which is becoming biological science's window into the past. Take the Neanderthals, for example. They were the closest cousins on our family tree until they died out about 30,000 years ago. But were they kissing cousins? Did they exchange genes with us? Scientists wondered. This year a team of scientists brought together by the Max Planck Institute in Germany actually decoded the billions of DNA segments extracted from Neanderthal bones. It was the culmination of years of research into retrieving intact, ancient DNA from the bones of humans and their ancestors. And what they found was as worthy of a supermarket tabloid as a scientific journal. The Neanderthal genetic code was closer to Europeans and Asians than Africans. If we had never mated with them, their genes should have been equally different from all humans. "We estimate that about one to four percent of the genetic ancestry of non-Africans is from Neanderthals," says David Reich, a geneticist from Harvard University and a member of the research team. Apparently, though, having some Neanderthal in us isn't a handicap. And the DNA revealed not just similarities but also genetic differences between Neanderthals and us, especially things that may explain how we adapted and survived better than they did. Ed Green from the University of California at Santa Cruz explained to NPR's Science Friday program, "We're using these data now to find some important episode of adaptation in our human ancestors not that long ago even since we split from Neanderthals." DNA technology has given scientists a telephoto lens to look even further into the past. Consider the 40,000-year-old pinky finger found in a Siberian cave. No one could make heads or tails of it until this year, when geneticists at the Max Planck Institute parsed out some of its DNA. Its owner was neither a modern human, nor a Neanderthal. It did, however, share a common ancestor with us, probably in Africa. Moreover, its DNA shows marked similarities with modern people from Melanesia. "This was a third population living at the same times," says geneticist Reich. "We don't know what tools they made. What we now know is that we get to know them from their DNA." And if scientists get DNA that's more recent, it can tell even more. For example, scientists this year got DNA in hair from the remains of a 4,000-year-old hunter found in Greenland. At the University of Copenhagen, biologist Eske Willerslev teased out remarkable details. "We can show that he was genetically adapted to cold temperatures," says Willerslev. "We can also show with a very high probability that he had a tendency to baldness, he had this blood type, you know, he had this skin color, et cetera." He had type A-positive blood, to be exact; thick hair; brown eyes; and of the two types of earwax that humans inherit, he had the dry kind. Scientists called the hunter Inuk. Willerslev says he's now going to use the same technique on some 8,000 year old mummies from South America. "I think ancient DNA becomes very powerful" now, says Willerslev, "because it gives you a direct look into the past." Ancient DNA does have its limits. Heat, microbes and water destroy it. So the raw material — bones, teeth and hair — are best preserved in very cold climates. But geneticist Terry Brown of the University of Manchester in England says that still leaves a lot of fossilized territory to explore. He says the more DNA scientists get, the more complex the human story will become. "I suspect that there are going to be more surprises around the corner," says Brown. "If there are other bones we can get DNA from, then I think it's possible we might find a greater variation amongst our earlier ancestors than we previously realized." And perhaps more clues to those things that gave us the human edge.